Recently I showed you guys my Fall kitchen and family room, all decked out for the season. I’m a huge fan of decorating on a budget, picking up small things here and there to festively fill my home. I’ve been getting a couple questions on where I’ve bought a couple things in both of those rooms so I thought I’d put together a little list for you guys today… plus a couple other adorable Fall finds! The pumpkin centerpiece and burlap garland are in my family room, and the autumn rules is in my kitchen. You know I also love those fabric covered pumpkins because they’re all over my home! 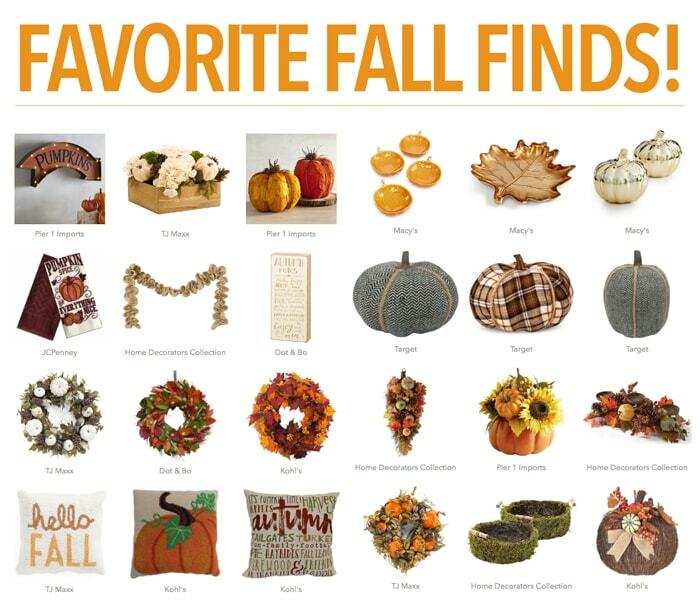 And what’s your favorite place to shop for seasonal décor? Oh my so much Fall goodness! Love those pillows there at the end but the plaid pumpkin might be my favorite! I like to shop at Kirkland’s too. They always have lots of seasonal items!